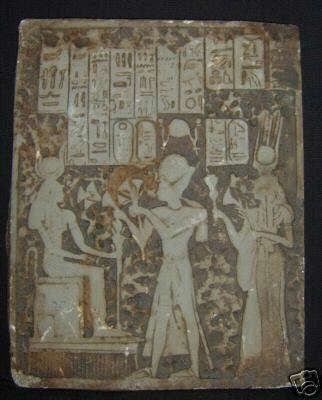 Sold on eBay by seller "Q"
VERY RARE PANEL WHILE RAMSES II AND NEFERTARI OFFERING TO HATHOR 19 DYNASTY ( 1295 - 1185 ) B.C.. RAMSES II AND NEFERTARI OFFERING TO HATHOR 19 DYNASTY ( 1295 - 1185 ) B.C. 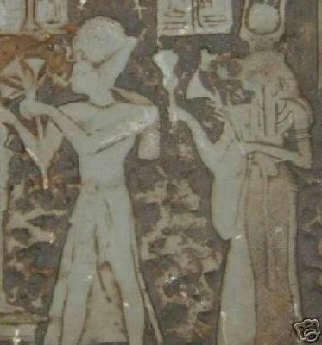 THE PANEL IS FADE AND SOME PARTS OF IT ARE CRACKED BECOuSE OF THE WEATHERING , THE WRITTING ON TOP OF IT IS THE WHOLE PRAYER RAMSES II AND NEFERTARI USED TO PRAY WHILE THEY OFFERING TO HATHOR. the panel is too heavy it wights 1.680 kilo and its lenght is 22 cm , width is 29 cm and thickness is a range between 0.9 - 1.8 cm.